When I am old and retired (70 years +), I don't plan to spend a lot of money. I'll be living in my own house that is already paid off at that point, so no rent or mortgage payments. Since I don't need to get to work every day, I wouldn't need (or want) a car, and would probably use a bicycle or maybe some cheap future-scooter... or just walk. In terms of activities, my life would revolve around my family, watching sports, a number of other low-cost hobbies to keep me busy, and intellectual studies (learn some of the sciences). My country has universal healthcare, so medical expenses are not a worry. Really, my only real expenditure will be food on the table every day, and helping my children out if they need it. Money is what I need/want now. House, car, insurance, gas, clothes, shoes, restaurants, vacations, etc, etc, etc, etc. With all that in mind, I am a bit confused to hear so many people talk about how they save 15-20 % of their income, despite often being young (as low as early 20s!). I can't understand that. What are they doing it for? Why do they need so much money as old people? I wish I took out more student loans. I wish I bought more expensive cars. I wish I bought fancier clothes. I wish I didn't save so much money for retirement. Money is what I need/want now. It turns out that this statement is true every single day of your life, including during retirement. Why do they need so much money as old people? My country has universal healthcare, so medical expenses are not a worry. Will it have UHC in 50 years? Probably... but will the co-payments rise significantly? I'll be living in my own house that is already paid off at that point, so no rent or mortgage payments. Your child/grandchild gets really sick needs a joint replacement or some such and UHC puts him on a very long waiting list, so you decide to pay for a trip to America. Natural disaster wipes your house away. The disaster wipes so many houses away that the insurance company files for bankruptcy, and it takes a long time for the government to pay you off. You or your spouse got greedy and invested in a scam. You want to travel. Sure, now you say, "my life would revolve around my family, watching sports, a number of other low-cost hobbies" but things change in 50 years. The reason some people save so much so young is that they understand the growth potential of COMPOUND INTEREST. Every dollar that I put away for my daughter at 2 years old can be worth $1,000 when she retires. * What would anyone do with all of that money? There are an infinite number of reasons why a person might want to save. Many believe that the current prosperity that we enjoy will not last indefinitely and they want to hedge against changes in the status quo. This is similar to other questions about why anyone would buy a new car when a used car is almost as good, and is significantly cheaper. The answer is that some people can afford it, others prioritize comfort, and others simply don't even consider the alternatives. *Assuming 11% return (which is the historical average of the S&P 500) over 65 years. Edit: I know all about interest and inflation. The only reason I presented a ridiculously optimistic scenario is to jar people into spending time thinking about it. I have already written elsewhere about the potential growth of savings for poor people, as well as those reasonably well off, but not objectively rich. It's clear from the votes on the top-voted answer that pessimism is a bigger motivator, that's fine too. I don't care why you save, but if you care about your future, please set some money aside. For myself, I saved because having accumulated a nice pile of money - enough to live modestly on the income (what I call being "independently poor") is both security and freedom. Take security. What are the odds that sometime between wherever you are now and your 70 year old self, you will find yourself out of a job, with no prospects of finding another anytime soon? Perhaps your skills are no longer in demand, and you need to retrain, perhaps you can no longer physically do the work you were doing, perhaps your country undergoes a prolonged recession brought on by ill-advised economic policies? (I've had all these happen to me.) What do you do if you don't have savings, live in a cardboard box and eat out of dumpsters? PMI = Private Mortgage Insurance. In the US, this is an extra charge on a mortgage payment if you have put less than a 20% down payment on a property. It is supposed to cover the lender's risk of property losing value (as in the '08 housing slump) and the purchaser simply walking away because the property is now "underwater" - that is, the outstanding balance of the loan is more than the property is worth. This very much depends on where you live. In the major cities of the costal USA many folks will be paying on mortgages until the day they die. This may not be under your control. It's not uncommon for folks in their 70's to have mobility issues. Heart, lungs, hip joints, feet, and knees may be failing. Of course they may have issues with driving too, as eyesight and cognition begin to fail. You may have to pay someone to drive you to shopping or medical appointments. Universal healthcare means you won't go broke, but it doesn't mean the underlying problems will all be fixed. my life would revolve around my family, watching sports, a number of other low-cost hobbies to keep me busy, and intellectual studies (learn some of the sciences). That's what you say now, but your 70 year old self may have other ideas. Do you have the same goals and desires now as you did when you were 12? The biggest problem you overlook is that nobody knows how long they are going to live. You may be frugal and in good health, but if your resources need to sustain you from from 70 to 110, you will still need a substantial nest egg. Reaching advanced old age and suddenly finding that you have no money is a very nasty experience, even in countries with strong social insurance programs. People in their 20s (and 30s) thinking about the future may choose not to gamble that the government in 50 years will look the same as it does today, and prepare for the eventuality of paying for their own medical care. Everyone has different retirement goals. Some people want to retire before they are 70, the earlier they want to retire the more they need to save now. Other people want to travel in retirement and drive a nice car. It just varies a lot. There's also uncertainty about future expenses. Medical expenses are much higher for the elderly, if you want to live in your own home until the day you die, you may require in-home care at some point, that could be very costly. Some people probably save more than they need because they over-estimate their future needs, it's not easy to know now exactly what one will want/need in the distant future, but living below their means now means they are less likely to come up short down the road. It's also worth noting that while some people do save 15-20% of their income, that's exceedingly rare, many more people save nothing substantial. What makes you so sure that you know what you'll want when you're 70? Seriously. When you where a child, if you ever even had the thought, did you predict your current life well? How about when you were a teenager? How well does a 13 year old understand what a 33 year old (just to pick two points on the curve) wants/needs? Project that (lack of) accuracy forward. I mean, certainly, you can make some educated guesses, but how sure are you? Sure enough not to leave yourself options? When you envision yourself at 70, what does that look like to you? What your parents/grandparents look like now? There's a good chance based on advances in health care and exercise advice that you at 70 may more closely track your parents at 55. Or not, lots of variance but don't discount the possibility that at 70 you may well be in the kind of shape the average 55 year old is in today, and you may well not be ready yet to settle down to the quiet life. I'm not sure that most people who are saving are thinking in these terms, they're following the received wisdom that saving is usually a good idea. But that's what received wisdom is: an aggregation of these kinds of insights that are valuable but difficult to reason your way through on first principles. Some of it is of course balderdash, but per Chesterton's Fence the onus is on you to prove the received wisdom wrong, not for it to prove itself correct. That doesn't invalidate the question, it's important to ask (and I upvoted), just remember where the burden of proof lies. Let's say I live like you describe, spending very little money beyond essentials like food. I spend much less than a typical person. Let's also say I have a typical, full-time job. Since I have typical income but less than typical expenses, what am I to do with all this excess money? I suppose I would save it. So a high savings rate doesn't necessarily imply a great need for money as you assume: in fact it can imply the opposite. 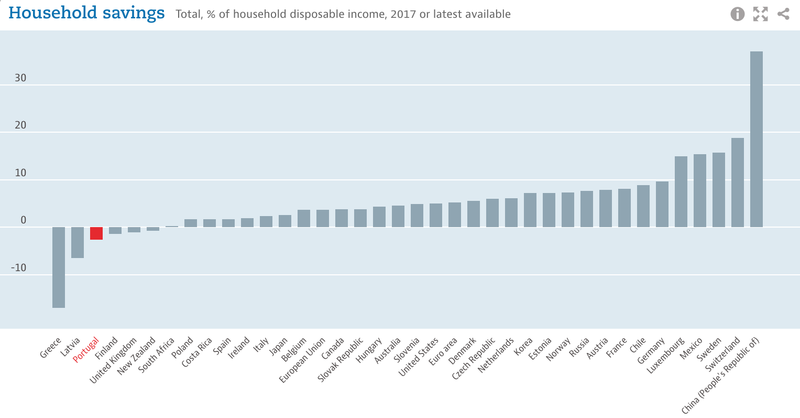 Unless you are in Mexico, Sweden, Switzerland or China, if you are reading of people saving over 15% of their income, it's because they have developed unusual discipline to not spend all their money on luxuries: they are living the frugal lifestyle you describe. Or they have higher paying jobs. Often it's both. This high savings rate isn't necessarily with the objective of amassing Smaug-like wealth, either. Since a high savings rate implies low expenses, less wealth is required to retire. Some of these high-saving people may just want to retire sooner. You are implying that saving is for when you are retired, and retiring is when you are above 70, which is wrong. Being retired doesn't forcefully mean that you're completely old. Some people retire earlier than others. If you retire around 50 or earlier, you still have plenty of time to spend your money with your family. Your saving isn't locked until your retirement either. If you suddenly wanted something expensive (e.g. a new car, a trip around the world with your family, a critical hospital operation, etc), you could either loan some money or use some of your saving for your family. Since I don't need to get to work every day, I wouldn't need (or want) a car, and would probably use a bicycle or maybe some cheap future-scooter... or just walk. Saving is not only for yourself. Some people save their money for their family (mostly their children), so they can do what you weren't able to when you were their ages for example. In the United States, you'd still have property taxes. These would be less than a mortgage or rent payment, but it's not nothing. And what are typical expenses for an old person with universal healthcare now? Previous answers have noted that copayments may increase. But my point is if you are aware of how much they would be if you were 70 at this moment? Universal healthcare is not necessarily free healthcare. You may find that there are optional services that are not included that you really want. Or that you are expected to pick up certain things on your own. You don't mention your country and I probably wouldn't know the details anyway, but I strongly suspect that you don't know the details either. We already discussed house. Car may be reduced; although you may find that you still have places that you need to go and that you need to pay someone to drive you. You still need house insurance, although you can let car and life insurance go. Gas goes with the car. Clothes and shoes may get more expensive, as doctors tell you that they need to accomplish specific things. I see no reason why restaurants and vacations will suddenly get cheaper. Utilities may increase in retirement, as you spend an extra forty hours a week at home. I just threw 15% into a spreadsheet, assuming a 4% return after inflation. The result was 18.89 times current income after 45 years of working. So if you started working at 22 and worked until 67. I then assumed that your post-retirement returns would drop to 3% (because you are withdrawing, which magnifies bad markets and requires you to set aside more money in low risk/return investments). And that you would spend 80% of your preretirement income annually. You run out of money at 106. You might argue that you don't expect to live to 106. You may well be right. Most people don't. But if you do, are you willing to sell your house at 106 to have a few more years with money? And if you are, what happens when that money runs out? At one time, the oldest person in the world was Jeanne Calment who had sold her apartment at age 90. She was allowed to live there until she died, but she moved into a nursing home at 110. She lived to be 122, outliving the buyer of her apartment by two years. You probably won't live to her age, but are you so confident that you'd bet on it? Doing the same calculation with 20% savings, I found that there were still 18.8 times income in savings after 45 years of retirement. These calculations assume that your income increases only with inflation. If your income is increasing over time, that makes these calculations worse. Because in your early years, you aren't saving enough to support 80% of your ending income in retirement. Of course, I'm also neglecting that many countries tax investment income less than wage income. But I'm also ignoring the impact of inflation (inflationary gains are taxed as well as real gains). My point is that a savings rate of 15% is not nearly as generous as it might seem. I'm a bit baffled that this isn't an answer yet, but retirement is not the free life you seem to envision. You don't have rent or mortgage payments, ok, but those are the only costs you no longer have. You still have to buy food, you have to maintain your home, replace furniture and devices, pay for electricity/water (which only goes up if you stop working), pay for internet, insurances. And that's just the stuff you have to pay for. You may wanna spoil your kids/grandkids, go on a vacation, pick up a hobby that goes slightly out of control, etc. And when you're in your deathbed you probably want to leave your loved ones a significant sum. Living costs money, being retired or not really doesn't matter a whole lot, you're utterly overestimating the drop in living expenses. To put it in perspective. I'm pretty young and I pay roughly 1500/month in living expenses. Only a third of that is my mortgage, the rest are things that wouldn't disappear if I suddenly retired. If I retire I get two incomes: government pension, which is about 800/month, and saved up pension, which is as good as nothing right now, but can be anywhere between 500/month and 3000/month depending on how much I work and save during my lifetime. So if I do the bare minimum and don't save at all on the side I can barely keep living like I do, but if I actively save up I can live royally from my pensions and do all the things I don't have time/money for now. Look at your list of things you need money for now. "House, car, insurance, gas, clothes, shoes, restaurants, vacations, etc, etc, etc, etc." Have you looked at what proportion of your budget goes to each? What proportion goes to the etc, etc, etc? Your mortgage goes away, assuming you don't sell this house and buy another. All the other house expenses continue. I don't know your situation but the claim to live without a car seems quite optimistic. You mention vacations but claim you will stop taking them. What are you going to want to do all day? It might cost money. As one step, take your current rate of spending. Deduct your mortgage and car expenses (I'll accept that temporarily). Compare that to the income you expect in retirement from social security. Do you have enough? Do you believe you know what the income from social security will be in 50 years? It's hard. If you retire at 70 and die at 71 you don't need much in savings. If you get tired of working before that and live to 90+ you might need a lot more. You are trading the last bit of enjoyment of money today for options in the future. That is a difficult trade to assess. Having money gives you much greater flexibility than not having money. You have the ability to do things that you wouldn't otherwise be able to do, support the causes that you believe in, and the reassurance that it'll take a (metaphorical) earthquake to seriously damage your quality of life. With money, you can support your children to go to university. Without money, they can still go to university but they'll likely end up with lots of student debt (or they need to be brilliant). With money, you can hire the best doctors and nurses and get 24-hour care should you fall sick. Without money, you have to put up with whatever the public healthcare system gives you. With money, you can endow a professorship at your alma mater and have your name etched into its history for life. Without money, this isn't even an option. With money, you can buy your own house, renovate it, hire professional cleaners instead of do-it-yourself. Without money, you might have to deal with landlords with whom you might not see eye-to-eye all the time. With money, one can deal with "losing my job" much easier without becoming destitute. Without money, one might find oneself on the streets. It is virtually always better to have more money than less, and with exponential growth added to the mix, it's a good thing these people are saving. People save for two reasons, which are really the same reason: fear and hope. what if someone I care for is very ill, and I need to take time from working for a year or more to help them? wouldn't it be great to go to Tahiti? As well, most people do not want to work until they are 70. They think it would be marvelous to work until they are 50, when they will still have a lot of energy to spend money traveling or taking up expensive hobbies like skydiving or world travel or carving large statues out of marble. Ironically, the things that make saving easy for you (low expenses and no plans to make those expenses larger and larger as you get older) make saving seem less valuable to you. People who are spending all they make right now worry how they will survive when they make less. They are really motivated to save even though it's hard for them, because they can easily imagine needing to draw on their savings. You asked "why do people save?" not "should I be saving" so I won't add to the people telling you to save. They save so they have a cushion against change, so they can reach a goal they otherwise wouldn't, and so that they don't have to work all their life. These are all perfectly sensible wishes and behaviours. Join then or not, but understand they have good reasons to do it. I am a bit confused to hear so many people talk about how they save 15-20 % of their income, despite often being young (as low as early 20s!). ... Why do they need so much money as old people? Others have already noted that saving such a high percentage is not overly common. I'll add: do the young people who save so much do so for retirement? Or are they saving, at least in part, for a car, for a downpayment on a house, or to tide them over while they try starting a business? All of these are very good reasons to save (and I am not even mentioning an emergency-fund, since people saving 15% presumably have this well covered already), and the time horizon is much shorter than retirement. Saving is simply spending less than you earn. Getting used to spending less than you earn is extremely good discipline. It allows you to take a temporary hit to your income without having to cut luxuries that you have gotten used to. If you get used to luxuries all your life, then the frugality you are budgeting with in your question may be hard to deal with when you actually get to experience it! Firstly, this question is based on a false premise. Most people do not save much at all. Many answers are saying that saving or investing for the future can be a security in case things go wrong individually. However, saving for the future, and in particular investing in the stock exchange for the future, very much assumes that things are not going wrong collectively. People save for the future, because they believe that the risk of things going wrong individually is larger than the risk of things going wrong collectively, and they trust that future returns from investments are broadly comparable to past returns. Investing in your own house is different from other investments; I will come to that. How may things go wrong collectively? One instance of hyperinflation, and all savings are bust. An economic crash just before you planned to retire with a fancy lifestyle, and you'll find the value your shares accumulated in 40 years have all vanished overnight, and you might not be able to afford to retire at all. The period since World War II has seen unprecedented wealth growth in western countries, fueled by a large variety of factors. There are many reasons to believe that may not continue equally in the decades to come. Climate change and an aging population may put immense structural pressures on the economy, in particular in service-based economies. Maybe the next 40 years will see the same average level of real growth, maybe not. People who invest in the stock exchange for the long term tend to assume it will. To me it seems a very bold assumption to make. I certainly would not make any retirement plans on the assumption of a 10% yearly increase in investment value. Anything that grows rapidly may crash rapidly, too. Having savings and investments will not make you worse off than not having them, all other things being equal. But all other things are not equal. Living an ascetic lifestyle now in order to spend your post-retirement life travelling the world, is no less risky than the reverse; you know you have the ability to travel now. You might not have this ability in old age. Invest in your house, have it fixed up to low-maintenance passive house standards, and physically secure it against whatever natural disasters are likely in your area (some houses will float in a flood). When all that is done, sure, save up money, but keep in mind that your house will always be there (short of war breaking out). Probably money will too, but you'll never know what it's worth. Save up some capital in a well diversified portfolio, but there is no need to exaggerate at the expense of your quality of life today. Finally, one reason for saving might be very simple: I might simply earn more than I can spend every month. I can either donate the surplus to charity, or not. If I don't, it means the default is that it just rests in my current account, a very simple way of saving. Just from reading your question, I can guess that you must be very young, early 20s, maybe even college age or younger. =) Apologies if that's not true, but I'll mostly answer this from a young person's (20s) point of view. When trying to understand why other people save or advise saving, it's worth keeping in mind that most other people are older than you, and most people start wanting to save more as they get older (even though when you're young is actually the best time to be saving). It's also worth keeping in mind that not everyone saves or wants to save. About 5% of Americans even have spent more than they have. There are also many high-income people with staggering credit card debt. I think it's safe to say there are many people that basically spend practically all the money they get their hands on, so not everyone saves. Because of this, I think the answer to your question is psychological: People who save do it because it feels nice to have money set aside. You can think of saving money as buying a cool device that, whenever you're scared of a bad thing happening, tells you "don't worry, even if it did happen we could easily throw money at it until it goes away - relax!". Some people like to pay for this "service", others don't, it's a matter of personal preference. As for why people save when young instead of old, it's just easier. Say you get a job at 20 that pays $4k/mo, but you manage to live on $2k/mo. In theory, all you have to do is keep going like that until you're 60, and you can retire and still live at the same standard until the ripe old age of 100. Of course no 60 year old can live at the same standard as a 20 year old even with universal healthcare, but anyhow. If you decide to save only $1k/mo of that, and treat yourself by spending the other $1k on luxuries, when you're 50 your retirement fund would already be $360k short (this doesn't even account for compounding gains from investment). You would either have to postpone retirement (yikes!) or tighten your belt and save a lot more (yikes!) or get a job that pays more (but that's hard) or live out your retirement on $1k/mo instead of $2k/mo (no thanks!). If only you had saved more when younger! Besides, someone who lives 30 years on $3k/mo would get used to this lifestyle, and couldn't necessarily switch to living on $2k/mo or $1k/mo. As for the question of "should you save when young": You correctly frame the decision as tied to one's expectations about how much they will spend late in life. Given your plans, broadly speaking it does sound like you don't necessarily need to save that much. Unfortunately you can plan all you want, but half a century is a long time and a lot can happen. Nations can crumble and empires could fall, and the world might easily change. Just imagine what your plans would have been if you were alive in 1978, and think about how well they would have panned out. Even worse, your own personality may change as you get older, and you might wake up one day and realize you don't like biking anymore, prices have gone up on groceries you buy, you suddenly "have to" spend money on things that you didn't even imagine could exist a few decades ago (smartphones anybody? ), you have acquired expensive hobbies, you did fall in love with a woman who demands fur coats and fancy cars and your government abolished healthcare just as you developed a very costly health condition. Far fetched, I know. The point is that just because you make a good plan, doesn't mean the world is obligated to accommodate it. And it's not even that easy to make a good plan for something that will happen many decades in the future. As already mentioned, in USA few people save fifteen percent. But there's a good reason many people save four to six percent—employer matching. If I got paid a thousand dollars (before I retired), I could put forty into a 401k and my employer would put in twenty. Would be foolish to pass up the extra twenty. Plus, no taxes on the entire sixty until I draw it out of the account (during retirement). Another reason many people set aside money for retirement is the number of so-called experts spouting the B.S. that it's not possible to retire without millions in savings. People take their word for it and don't check the math. I know it's nonsense because I retired with only $70K and I didn't even need that. My total expenses in the four years since I retired averaged thirty thousand a year, and a good portion of that was unnecessary luxuries. Actual living expenses (food, lodging, clothing, medical) for four years were $67K. Transportation to over twenty countries, $24K and the rest luxuries. (67+24)K = less than my Social Security and pensions. TL;DR: Do your own math; ignore the "advisors." Why don't people save so much? Nothing is certain; healthcare and benefits can all be changed/reduced and they don't cover everything. Some mega IT company creates an AI that replaces you or outsourcing to an other cheaper country becomes the norm. Or let's go really crazy and we get in a financial crisis (cough 2008). I would rather have my (modest) house and (modest) car and enough saved up to bridge 6-24 months of expenses than spend it on expensive vacations, cars, etc. First of all, many save because they do not yet have a house with mortgage paid off. Everyone that happens to not end up with their own house at the end of their working life will have to consider how to pay rent until the end of their life (with very frugal amounts of money coming from whatever social network is applicable in your country in a few dozen years). Secondly: It is not that bad to have saved too much and end up with a surplus when you die. It can be devastatingly bad if you run out of money before dieing though. Spending a decade or two in a decaying body, in abysmal living conditions? Doesn't sound too good. Thirdly: most people who live in conditions where they can save money (i.e., are not at rock bottom) can arguably more or less comfortably do so. It's easy to stop saving, so you may as well do so as long as you can. Fourthly: age can be very expensive. Illness, or having people come to work for you (in the garden, on your house...) when you're not able anymore, and so on. Any finally, the sense of security, which is strong in many countries (often stronger than in the U.S., as far as I heard, which seems to have a more "gung-ho" attitude in some respects, maybe?). All of these give you a pretty strong reason for saving. Being wealthy means having more options; not just having more money. And saving is part of being wealthy. So many previous answers. I am in the learning stage now and I am not as intelligent than those who have already answered. I personally think, it is my responsibility to take all necessary steps to protect my future; specially when I will not be able to (or will not want to) go to work. I have to consider all the possibilities I cannot predict today. Saving is just one of those steps. Saving money in the sense of conservation is good in general but it should not be the first principle. First principle is to create value and keep doing it. The more you understand and gain experience the more it becomes passive (indirect) earning. You seem to be assuming excellent physical health. Most people have some deterioration in what they can do long before they die. As your ability to do housework and home repairs reduces, you will need to pay for those services. With no car, if you are not fit enough for bike riding, extended walking, and public transportation you will need Uber, taxis, or similar to get anywhere. In more extreme situations, you may need someone to help you get up, shower, and dress each morning. You will have a choice between paying people to come to your house, or selling it and going into some sort of long term care home. Either way, you will have more options and a much more comfortable life with some money than without. You are fully correct that money now is more fun than money later. When I was 16 years old, I could probably go for 48 hours without sleep and drink half a dozen of bottles of beer in the process. Now at 26, I could do 24 at most and that is only if I don't consume any drinks. Which version of me would thus have more fun on a foreign trip, given the same budget? Probably the 16 year old. Money is the only thing you can truly rely on in our capitalistic world. Your spouse can leave you, your children could be egoistic, your social security check might be taxed to death by future governments, but whatever savings you have are reliable. Unexpected large expenses can come up at any time - an expensive liability lawsuit, a divorce, a life-saving surgery, etc, etc. People don't want to end up in poverty, either when they're young or when they're old. If you're young and extremely poor, there's still lots of options available (scholarships, better education, working longer hours, etc). If you're old and extremely poor, your options are very few - become homeless or commit suicide. Given all the facts above, the kind of people who do save money make a decision that living on the streets or committing suicide is not the right solution for them and thus decide to mitigate that risk by saving. Some choose not to think about the issue and don't save anything. Some have nothing to save in the first place. And some did calculate the risks and don't save regardless. Finally remember that 50 years from now you would be a completely different person and thus might have a different outlook on life. Forcing your future self to choose between a rock and a hard place is potentially not the best decision you could make. Not the answer you're looking for? Browse other questions tagged savings retirement risk compound-interest or ask your own question. With the likelihood of disability, should I save for retirement? How much should a graduate student attempt to save? How much should I save each month so I can retire early, in my Third World country? Why don't people generally save more of their income?